She's Fantastic: Marvel Legends JEAN GREY (and Customization)! 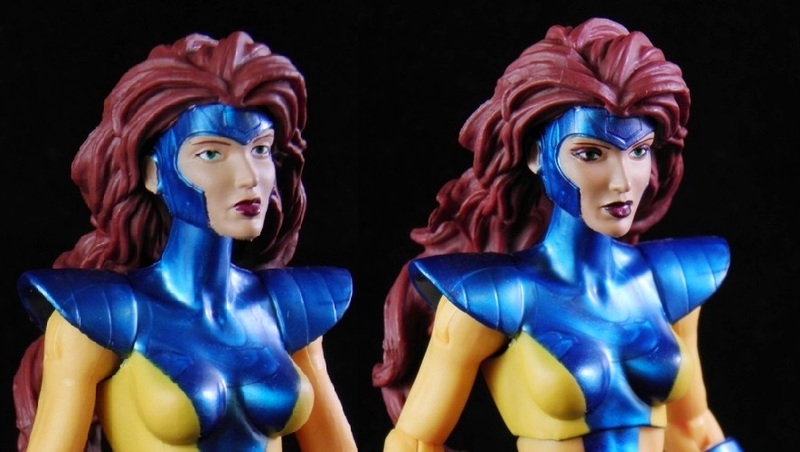 Marvel Legends JEAN GREY (and Customization)! Jean Grey is the matriarchal guineapig of mutantdom. She has been through more character upheavals than almost any other superhero I can think of. We're not talking about the run-of-the-mill costume change every decade. No. Jean Grey has changed powers, names, costumes, allegiances, identities, and even mortality status with alarming regularity. One of the most beloved iterations of Marvel Girl was the early 1990's Jim Lee & Chris Claremont version that we see here. This look is not my favorite by any stretch of the imagination (it always seemed very illogical to be hanging out at the mansion in a uniform like that), but lately I've really come to appreciate the design as a relic of a bygone era of comics. I'm frankly surprised we haven't seen this costume in 6" action figure scale before this. And, noting that, it's a shame this didn't get put off a little bit longer until the new Moonstone body becomes the standard buck (which I'm hoping will happen soon!). Let's check her out below! I had a few issues with the facial paint apps on this figure, but I did a really quick makeover and I'm 100% happy with the results. It seems like they just cheaped out with the eyelashes and adding them back in made a world of difference. As is, she looks sleepy and bored. I'll post before and after pictures at the bottom of this review. Alright, here's my customization photos. Literally all I did was add some dark red to her lips and line her eyes with a little of the same blackish-red. I spent 10 minutes doing it and I think it really woke her up. (Although I probably sould have taken my time and made the lines a little crisper). This is a figure I have wanted since ML began. I loved the 90's X-men cartoon when I was young, so this is my favourite Jean outfit..though I agree it is far from her nicest costume. She does look a little bored. Your work on the eyes makes her look much better. Hasbro are improving all the time & I would love to see them re-visit 90's Jean again in both ML & MU some day. I had a lot of flesh-colored paint on the blue of her headpiece. Luckily I realized that the flesh was painted over that swirly blue plastic so i was able to scrub and Xacto-away all the random flecks and really clean up her face. But then I couldn't resist the eyeliner custom. Your group pic looks great. So jealous of your Psylocke. I have so been waiting for this figure. I love the image used on the back of the card and I love what you did with her eyes! She looks really cool. The Dodson art on the cardback is stunning. Honestly it's that image that is making me rethink my stance on this costume. I've been following his blog since he did that awesome She-Ra cover this summer and he posts a lot of step-by-step images of his art. I was kind of hoping that these cardbacks would show up in a post, but no luck so far. The best thing about this Jean is her hair, which is how i envision her as Phoenix. i stopped reading comics in the 90's as i hated them, they looked cheap. But i got a glimpse of this costume, i agree it is strange. Poor Jean Grey. One of the most messed up characters ever. Funny how in all merchadising and games the Phoenix costume is the most used, and to me that was just perfection. The hair IS pretty amazing on this figure. It's kind of like the recent DCIE Poison Ivy which had Amazing hair, but lackluster everythign else. I hope some customizers make good use of it!